This post does contain affiliate links from Amazon. If you were to make a purchase, I would receive a small commission. I’m kind of a hippie. Okay more like modern hippie. I don’t practice free love or blowing trees but I do live somewhat of a granola lifestyle. I cloth diaper, breastfeed, sought a natural childbirth through a birthing center, prefer a homeopathic approach to most ailments and do my best to live eco friendly. More specifically, over the last few months I’ve been striving to still lessen our carbon footprint on the planet by incorporating more eco friendly changes that would fall in line with a zero waste or low waste lifestyle. Zero waste, for those of you wondering, is reducing your waste to almost non-existence, reusing or repurposing what you can and recycling the rest. While it is a rather simple concept and some of our more recent changes have been fairly easy to adopt, I know we’ll never be 100% committed to zero waste (more like low waste). While the reasons are few, the main one is that we are not vegan. From what I have found, most people who live zero waste also happen to be vegan. Being vegan, all of your food is either consumed, composted or reused (using leftover veggie scraps to make homemade veggie broth) which eliminates a lot of food waste. Where as most things animal related (meat, dairy, eggs) is headed for the landfill. You can’t reuse the packaging from meat and most bones end up in the trash even if you have a pet who prefers them over dry dog food. A lot of cheeses come wrapped in a plastic that isn’t recyclable. Unless you’re composting or have your own garden, all of your egg shells will end up in the trash. My mom, son and MIL picking lettuce to make a salad as part of our Christmas dinner. In our household myself and our daughter are mostly vegetarian (we do eat seafood sometimes + consume eggs) while my husband and son are die hard meat eaters. But my son does eat his fair share of vegetarian meals simply because I prepare most of them but he does love a good veggie too! But as I’ve mentioned earlier, we’re not a 100% but we do try to do our fair share. Below I’ve detailed 16 different ways we apply the zero waste lifestyle to our lives which has not only helped lessen our carbon footprint but has saved us money in various ways. I didn’t think much of my soap buying habit with regards to the Good for you soap from Whole Foods but it's a great alternative your standard plastic packaged body wash or soap. Its package free, fair trade and made with good for you ingredients. This is great for a number of reasons. You get to customize your skincare. You can make some items in bulk such as body oils or butters. You can reuse containers once you run out of a product. I’ll admit buying some of your supplies will come in plastic packaging but typically they are recyclable and you’ll need to purchase them far less than a particular product bought from the store. 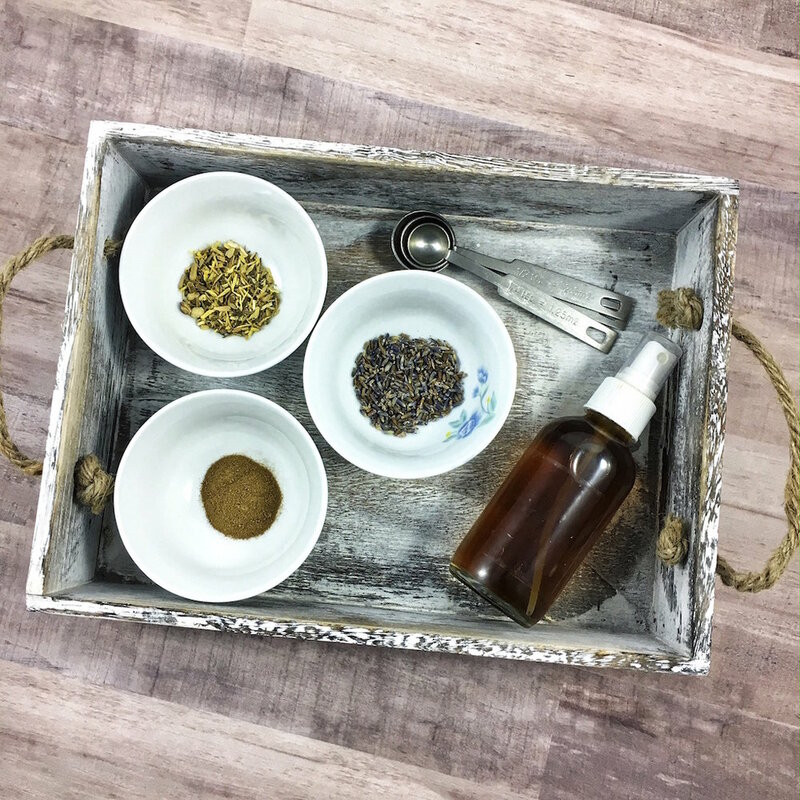 Lavender, licorice root and white willow bark extract are the star herbs in my DIY toner. I’ve been more diligent about bringing my own grocery bags when shopping even going so far to always keep a couple folded ones in my purse if I forget. If you happen to forget opt for paper bags (HEB has them, they just don't display them)versus plastic because they are more easily recyclable. Plastic bags have to be recycled separately by returning them to the special bin outside your grocery store if they have one. But who ever remembers that? Instead of the many plastic bags to collect your produce while shopping, opt for reusable versions that can easily be washed after use. Also I’ve recently started using mason jars to collect my items from the bulk section such as rice, nuts, dried fruit and beans. Whole Foods and Sprouts allow you to bring your own which I love. You have them weigh all your jars before shopping. They will then subtract the tare weight upon checkout. When you go home there is no transferring from a package to a container. It's already done. Plus you can always see what’s needed with a quick glance and purchase only what you need for the week instead of all the wants. Our front and backyards are small in size so a manual mower was an easy choice for us as well as the battery powered edger. I enjoy mowing the lawn myself and it's a pretty good workout or warm up if I have more time in my day to hit the gym. This one is pretty simple. You’re not spending money and the bottle goes wherever you go. Currently I have a corkcicle that was gifted to me a few years ago by the MIL. Instead of throwing away food scraps from your veggies, fruits, coffee grounds, paper towels plus a few more I can’t remember, you can compost them to create nutrient rich soil for your garden or flowers. Food from our garden has tasted far better than anything we have purchased in the store. It takes some work but there’s nothing like going in your backyard to pick some herbs or veggies to put in a meal that you didn’t have to waste time going to the store to purchase. Since I stopped using ziploc bags about a couple of months ago, I honestly don’t miss them. Between the rubbermaid sets and a few mason jars we already owned plus a few more recently purchased, we don’t have any use for them. Whenever my husband needed new cartridges for his razors, I dreaded it because the prices were so outrageous. I was able to coupon get them for cheaper but still I constantly had to buy them. For father’s day last year I invested in the Bevel system for him. Its pricey initially but the blades are easily replaceable AND recyclable. At $10 for a pack of 20 replacement blades the savings have been great!! Plus if you take care of your blades by letting them dry properly, you will get good use out of each one before replacing it. Most items are package free. But if not, you could bring your own containers and give them back theirs to be reused. Sometimes it's a little more than the grocery store but I love getting to know the people plus helping to support their families. This time we skipped the farmer's market and went straight to the farm to pick strawberries. I know it might be easier just to put them in bags that they can throw away so there’s less dishes to be washed or concern about all of your containers not coming back home. But you can opt for an all in one lunch box like this one. I wish I had opted for the stainless steel option although it is much pricier but more sustainable. He’ll still get plenty of use out of this one in the meantime. My son loves drinking out of straws. We have gone through sooooo many straws for that reason. Between the packaging and the straws themselves, it's just trash upon trash. I bought these and they’re reusable for years. But at the end of their life, recycle them and purchase more. I recently just purchased a couple of brushes (this one and this one too) to replace our plastic one purchased from Ikea. The wood is not only from a renewable source but is also compostable at the end of its life. Personally some of my favorite pieces of clothing have been bought at thrift stores. Blazers, purses, pants, scarves, jewelry, you naaaaaame it, have been purchased from various thrift stores over the years.The jeans I’m currently wearing, thrifted. Why? Because I’m still losing weight and feel no need to spend money on something I’m only going to wear temporarily. I recently was going through my son’s clothing to see what he had outgrown and came across a few shirts that had stains that will never come out. Normally I would have thrown them away but instead they’ve become my favorite “tools” to clean bathroom counters, mirrors and the outside of the toilet. I would go through a few sheets of paper towels doing the same jobs. Recently, like last month, I switched over to the Lena cup. While it is a bit “interesting” to use, I prefer it hands down to tampons which are uncomfortable and pads which move and bunch up. Not sure where to start, go here to find what cup(s) work best for you. I recently ordered these toothbrushes to replace the plastic ones that are currently being used by my husband and son. Although I still have a few heads left on my Sonicare toothbrush, I decided to go ahead and test it out. I really like it and feel that I get as good a cleaning from this brush as I do from my Sonicare. Definitely a win in my book! She says that you can also write "refused" and "please take me off of your mailing list" on first class mail and put it back in the mailbox for the mail person. Caring for the environment in the hopes of leaving something behind for our children although at the rate we're going we could get blown up any day...cue deep, tired sigh. It doesn’t mean having to go all in and living out of a backpack with only 5 items of clothing and eating only what you can forage. That’s extreme but you get the gist. Just like life, living a certain lifestyle doesn’t always mean an all or nothing mentality. Start with what you can do, on your budget, your time and what works for your family. This is just what has worked for us. Find what works for you and do that. If can do more, do so. Every little bit helps.